Carefully selected by his son and archivist Mark Watts, You're It: On Hiding, Seeking, and Being Found features more than 10 hours of newly restored historic talks from the "spiritual entertainer" who helped define Eastern thought to audiences in the West. Here is a rare chance for listeners to experience the enduring brilliance of one of the greatest spiritual voices of the 20th century. Alan Watts died 11 years after I was born, and I had not been exposed to his work until now. And I have to say I thoroughly enjoyed this recording of his discussions. It made me think. It made me laugh. It confirmed some of my deepest held convictions and dispelled a few misconceptions, especially my opinions, which apparently were not well formed and insufficiently researched, of Zen Buddhism and Hinduism. This collection of Watts speaking before small groups of people some time in the late 60s or early 70s is poorly recorded and often long, but it felt perfectly captured and all-too-short to my ears. This series of lectures is a comprehensive compilation of Watts teaching on Buddhism, Zen, Hinduism and Taoism. Plus there is also the humor of his one-of-a-kind philosophy based on years of studying the Eastern religions and philosophy. As an Anglican Priest he also has great insights into Christianity. Once you've listened to this you've got everything Watts had to give. Although like me, you may find yourself drawn to rehearing these humorous and insightful talks over and over again. I had never heard of Alan Watts. 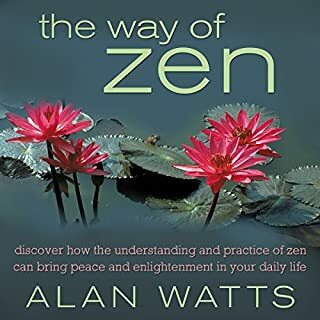 I've heard many other philosophers like Wayne Dyer, Deepak Chopra and others explain eastern/western spirituality, but the way Alan Watts explains it is very easy to understand and profound. I would have to say this is one I'll listen to several times. I've listened to Alan Watt's for years but this collection is unique. Over several recorded talks he ties keys themes of the great faiths into a common liberating thread. No particular religious point of view is needed and neither are they demeaned. Like so many profound ideas, you may not get it on the first pass but after hearing it from more than one point of view it becomes clearer than ever. Just discovered him, so I guess that makes me late to the party. Better late than never. Makes complex ideas digestible and interesting. One of the few authors I would listen to a book and then listen to it again immediately. 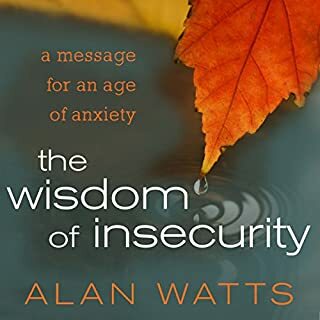 Currently reading The Wisdom of Insecurity. Another treasure trove of insights. This man is a genius. 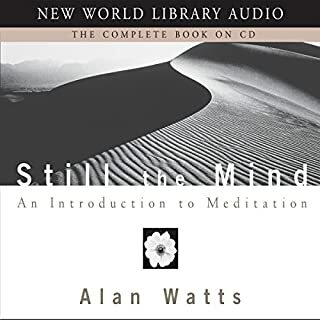 The audiobook is perfect for people who are tired of the "spin" associated with spirituality and want to deepen their understanding of the possibilities & philosophies of the human condition. So many people out there like to present thoughts and ideas in a way that gives you the answer.....The answer from their perspective. Alan Watts, in "You're It!" presents thoughts, ideas and perspectives that encourage you to think for yourself. He does not tell you what to do, or how to do it....He allows you to arrive at that on your own. What you do with it is up to you. 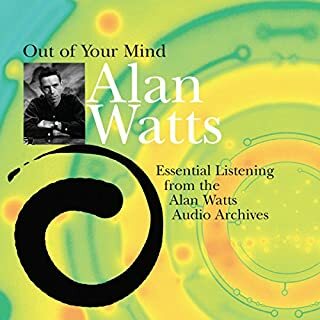 Alan Watts does not speak "like" anything....He is an intellectual (An intellectual is a person who uses intelligence (thought and reason) and critical or analytical reasoning in either a professional or a personal capacity.) and if this sort of thing bores you....Well, listen to it three more times. I find that I randomly select a chapter and listen for a bit every day.....It's that good. This book will transform your life! Watts does repeat himself about the yin and yang of life at times but it correlates to what he talks about in that specific lecture. Nevertheless, this lecture runs deep into a beautiful view of the world and the individual. It fits well with "Out of Your Mind." I recommend OYM first then this one. Both are equally interesting that touch different topics. Highly recommended! 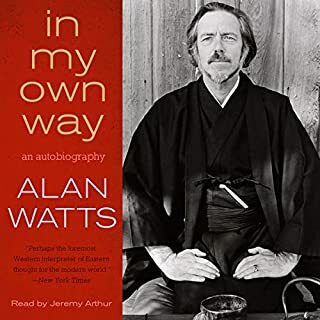 While you won't be in agreement with everything Alan Watts says, nor find all of his topics compelling, you're bound to find new perspectives in this book. Even if you've studied Hinduism, Buddhism, and contemporary philosophy, you're bound to learn something significant about these topics from Alan Watts. Maybe you'll emerge from listening to this book a bit more enlightened, a bit more tolerant, and a bit wiser. I feel as though I did. The experience of hearing somebody talk has never been so fruitful. Watts' clarity and spirit resonate with wonderful energy, reverence an humour. I listened to the entire 12 hours over the course of a week. I am now about to start listening all over again. The intellect of the man is unrivalled in its expression through the spoken word. For many years I have been loath to think of the spiritual, due to an association with the seemingly flimsy concepts of the main theistic religions. It is sometimes tempting to dichotomise a view of the world into scientific or spiritual terms - Alan Watts' genius is in his unrelenting, logical and passionate questioning of all preconceptions, which reveals to us that all our ideologies and rationalities are founded upon ultimately fallible principles. His philosophical rigour is formidable, but his spirit playful. I think that listening to this audiobook would, to varying degrees, irrevocably alter anybody's world view. A gift. Where does You're It! rank among all the audiobooks you’ve listened to so far? 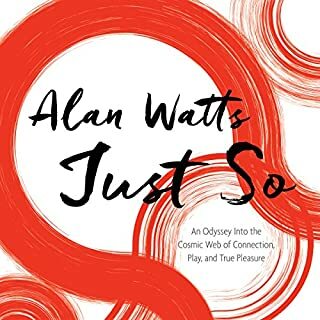 Anything with Alan Watts name on is gong to be enigmatic and motivating. His form of pragmatic spiritualism is great for western listeners as he's mediating between his understanding of eastern philosophy/spiritualism and western culture. This book is not really a book, it's a recording of some his lectures in America. The audio quality is not great - imagine watching lecture video filmed from the middle row. But his content is great and hearing the audience and the way he works with them is as intriguing an experience as reading some high minded literature. It makes you wonder how much his charisma was a cause for his popularity as we're his ideas.Not your regular audiobook and requires some dedicated listening - I tend to dip in and out every few weeks - I enjoy it every time. You really are your own God. If you could sum up You're It! in three words, what would they be? This is a clearly illustrated ancient message, put across in excellent audio format. What other book might you compare You're It! to, and why? I compare this to the likes of David Hawkins, for its depth, intelligence, and educational value. Alan Watts is a superb, charismatic performer, who brings passion, enthusiasm and most of all a down to earth feel about it. I listened to it a bit at a time because of its educational purpose. Alan Watts was a talented educator, who knew his subject extremely well. This book is exceptional. You can learn and understand so much from listening to this very clever, funny man. I would rate it with ten stars if I could. Allan Watts talks about philosophy in a fun, practical way which is easy to understand and to translate/use in everyday life. Highly recommended! If you have a hole in your life, get this. You will not be disappointed with this audio collection. Lots for you to contemplate on, and plenty of laughs, and stories along the way, to help you understand what he is talking about. Alan Watts has a well deserved reput. Great anthology of seminars with little repitition of content. A volume of reference sessions to return to. Amazing insight on how to ace daily life! Astounding vision and creativity of explanation... a million thanks for leading the way... an absolute must read! 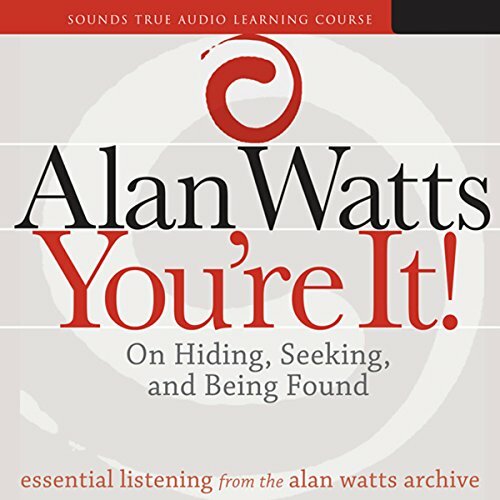 Chose this as my first free audiobook, what an incredible investment.. having already listened to a few of Alan's lectures through youtube, I was fully aware of I what I was getting here, and was not disappointed. An insightful, useful and inspiring book, delivered with perfect pacing, making it easy to digest. Read with humour and true passion. I love Alan Watts and 12 hours of his recorded lectures are a great way to pass the time, broaden your perception of reality and submit to the great no thing. As well as an insightful overview of many eastern philosophies. I have enjoyed listening to this audio time and time again (I think I've played it 16 times, and always hear something different/new). While there are some issues you may not agree with there is plenty to "wake you up". Alan Watts's lectures are as relevant today as they were in the 70's. Delivered with his odd sense of humour, you can not take away (and feel) the deep moments through the lectures. His depth and passion are evident throughout. A true brilliant and mind changing collection of lectures. The best purchase in decades. Alan doesn't preach, he just explains what is; all that is left is to understand. The guy is a genius, there’s really nothing else to say. Other than he’s a genius . Was. love listening to Alan Watts, he's perspective and explanation on major belief systems are well explained for those looking for answers. Didn't find this all that inspiring. I disagreed with him on a couple of points up front - eg. you don't need a guru. Watts was one of the true greats of public speaking and conveying some of the most grand and amazing concepts. This is easily some of his best work compiled together and a must listen for anyone that is feeling a little lost in the world or themselves.